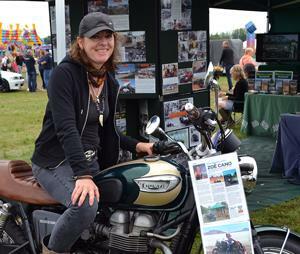 From an ex-copper’s 12 month, 70,000 mile trip on his GSX-R1000, to a middle aged mums seven year globe trotting adventure on a Royal Enfield, next year’s Carole Nash MCN London Motorcycle Show is THE place to find some inspiration for your next big bike trip. Curated and presented by adventurer Nathan Millward (author of Sydney to London… The Long Ride Home), the Tom Tom Adventure Zone stage will host eight of the UK’s most inspirational travellers giving talks and slideshows of their groundbreaking and fascinating trips. Once you’ve been inspired by their amazing stories you can visit scores of stands in the Tom Tom Adventure Zone where you can book your own trips, buy adventure kit, get a book signed or grab a selfie with your new globe trotting heroes. The Carole Nash MCN London Motorcycle Show runs from 17-19 of February at the Excel Centre in London Docklands. Standard adult tickets to the show cost from £17 in advance and kids under 15 go free. New Paddock Pass tickets, with exclusive access to the stars, a private bar area and tiered seating cost just £40 (includes general admission) but they’re in short supply so book now! Bruce Smart is a London based copper who in 2013 took some time off to travel 70,000 miles around the world on his GSX-R1000. Bruce completed the trip on the second attempt having had issues during the first. It's a great story of making a plan and sticking to it, not to mention finding a way to fund it along the way. Understated and keen to keep a low profile, Johanna rode her Triumph Bonneville through Europe, the Balkans, Turkey and into Iran on what was a remarkable solo adventure. Camping wild and travelling without a plan, Johanna will be telling us more about Iran and how to get off the beaten track. Kitting your bike out for Adventure - Leading after-market suppliers Touratech on the things you need and don't need for your next adventure. At the age of just 22, Rhys Lawrey embarked on a journey around the world on a Triumph 800XC. 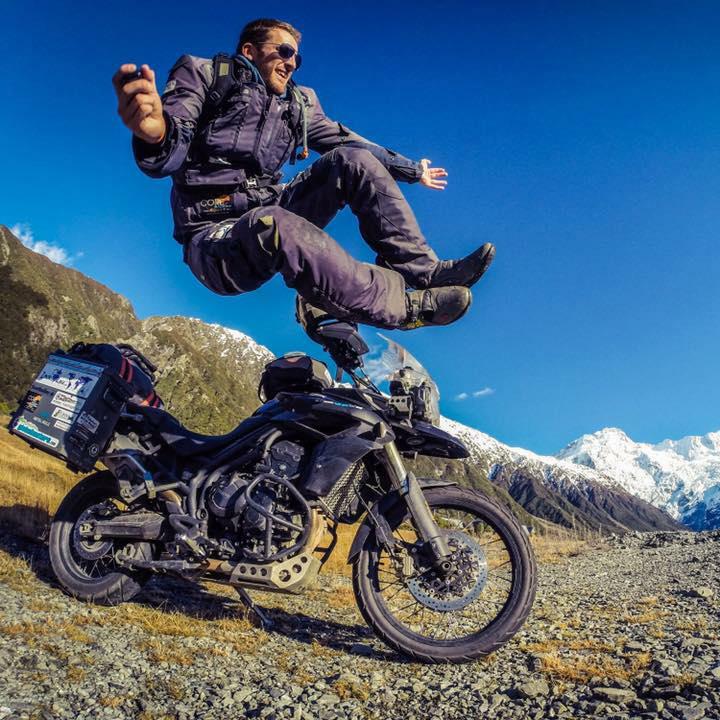 He broke an unverified record for youngest person to circumnavigate the world and will be telling more about his travels as well as about the act of motorcycle shipping and what it entails. 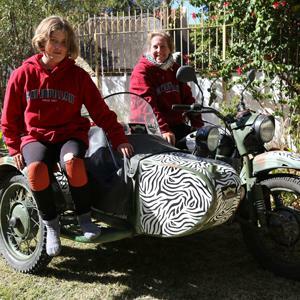 The mother and daughter duo of Melanie and Sofia Cowpland tell a unique and inspiring story about riding the length of Africa in a Ural sidecar. The problems they had were numerous but their spirit and endeavour was remarkable. The aim of the trip was to raise awareness for autism, a condition that Sofia (the daughter), suffers from. It really is an amazing story. Rob shipped his trusty Honda CG125 out to South Africa and spent the next eight months riding in the direction of England. He tells a great story about travelling on the cheap and immersing yourself in local cultures. A retired nurse and mother of two with kids that had flown the nest and a marriage that had broken down. Rather than dwell on things Jacqui Furneaux took to the road on a Royal Enfield 500 Bullet, spending eight years on a broken loop of the world. The focus of her talks will be on India. 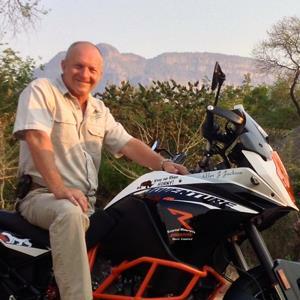 Alex completed a 10,000 kilometre ride around Southern Africa to help promote Anti Poaching of African Wildlife. Ever since then he's leads tour groups and is an anti-poaching ranger. 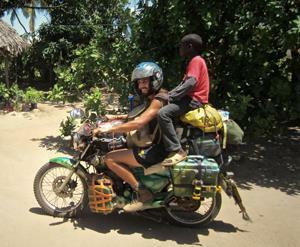 Alex will be on the Adventure Stage, along with his bike, to talk more about his passion for Africa, a place he's keen for others to see. 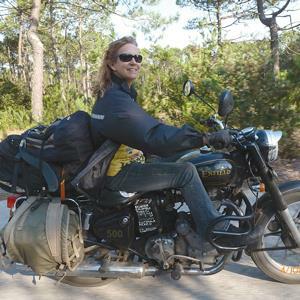 Author of Bonneville Go or Bust and Southern Escapes, Zoe Cano is an experienced traveller of the USA and will be on hand to give advice and guidance for anyone planning their own adventures across America. RiDE magazine Editor Simon Weir on things to think about when riding Europe. Take a journey along the Mother Road - Chicago to LA - with the guys from Hadrian Tours. Foggy introduces ZONA, a unique solution to the age-old problem of poor rear vision for motorcycles. Explore your own doorstep with an introduction to green-laning by the Trail Riders Fellowship. Well into his seventies and lined up as a guest at last year's show, Ian then fell off a ladder and ended up in a coma, missing the 2016 event. 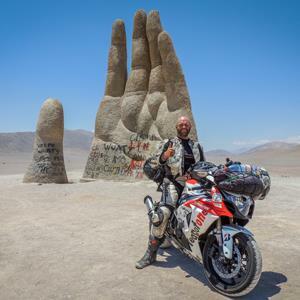 Thankfully he's back and in good health for 2017 to tell us more about his epic 15 year odyssey around the world on an original Honda Africa Twin. The real star of the show is his wife, who somehow puts up with him. Adult Paddock Pass £40 includes tiered seating plus the chance to get your favourite rider’s autograph and enjoy Slide with the best view in the house. Currently there is Paddock Pass availability for Friday am only – once they are gone they’re gone.